Kaid al Dhahab, the new AQAP emir for Baydah province. Photo from The Yemen Post. The US killed a local commander for al Qaeda in the Arabian Peninsula and two other fighters in the first reported drone strike in Yemen in 20 days. 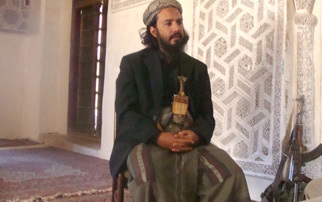 Kaid al Dhahab, the AQAP commander, served as the group’s emir in the central province of Baydah. The CIA-operated, remotely piloted Predators or the more deadly Reapers killed Kaid and the two other fighters this morning as they were traveling in a vehicle in the village of Manasseh in Baydah, tribal sources and officials told AFP. Mohammed Albasha, Yemen’s official spokesman in Washington, confirmed Kaid’s death in a statement on Twitter. “AQAP’s commander in Baydah, kaid al Dhahab, the Emir of AAS [Ansar al Sharia, AQAP’s political front in Yemen] in Rada’a was killed in an airstrike. He evaded capture\death before,” Albasha said. AQAP has not released an official statement confirming Kaid’s death. The identities of the other two fighters killed in the strike have not been disclosed. Kaid and his brother, Nabil, who is also a senior AQAP official in Baydah, have been the target of a US drone strike in the past. On May 28, 2012, the US targeted Kaid and Nabil in a strike in the town of Rada’a. Kaid and Nabil were tasked with regrouping AQAP’s forces in Baydah after Tariq’s death. The two leaders are also the brothers-in-law of slain AQAP leader and ideologue Anwar al Awlaki, who was killed in a drone strike in the fall of 2011. According to Albasha, Kaid “built an AQAP training camp” in Manasseh, and “commanded dozens of AQAP fighters” in Abyan, “where he was wounded” while fighting against the Yemeni military. The US has conducted 13 drone strikes against AQAP in Baydah province since March 2012; prior to March 2012, there were no drone strikes in the province. The last strike in the province was on May 20; two AQAP fighters were reported killed in the strike. The two previous drone strikes in Baydah province killed two notable local AQAP operatives. In January, US drones killed Mukbel Abbad, a senior AQAP leader in the province. Abbad was a brother-in-law of Tariq al Dhahab. And in December 2012, a drone strike killed Abdullah Hussein al Waeli, an AQAP operative from Marib province who escaped from prison in 2010, and an unidentified Jordanian. Today’s strike is the first in Yemen since Aug. 10, when the US targeted AQAP operatives traveling in Lahj province. Between July 27 and Aug. 10, the US launched nine strikes in Yemen. No drone strikes were reported for seven weeks prior to July 27. The burst in attacks was related to an al Qaeda plot that was uncovered by US officials. The US closed down more than 20 embassies and diplomatic facilities across Africa, the Middle East, and Asia. The plot is thought to have involved AQAP. The US has launched 22 drone strikes in Yemen so far this year. Despite the recent uptick of activity at the end of July and into the second week of August, the pace of the strikes has still decreased since last year. In 2012, the US launched 41 drone strikes in Yemen against AQAP and its political front, Ansar al Sharia. The previous year, the US launched 10 drone and air strikes against the al Qaeda affiliate. The strikes are being reduced as the US government is facing increasing international criticism for conducting the attacks in both Yemen and Pakistan. Although six senior AQAP operatives, including the group’s deputy emir, Said al Shihri, were killed in strikes in Yemen in 2012, the group’s top leadership cadre remains intact. Just two weeks ago, AQAP confirmed that al Shihri, a former detainee at Guantanamo Bay, was killed; he is thought to have died or to have been seriously wounded following a strike in October 2012. The US has targeted not only senior AQAP operatives who pose a direct threat to the US, but also low-level fighters and local commanders who are battling the Yemeni government. This trend was first identified by The Long War Journal in the spring of 2012 [see LWJ report, US drone strike kills 8 AQAP fighters, from May 10, 2012]. Obama administration officials have claimed, however, that the drones are targeting only those AQAP leaders and operatives who pose a direct threat to the US homeland, and not those fighting AQAP’s local insurgency against the Yemeni government. With all of the world attention on Syria (and Iran), now would be a good time to accelerate efforts in Pakistan and Yemen. Yes especially when the strikes start. Acquire some good target data them wham! Happy Hunting Fellas!